Honoring the truth in YOLO, my friends Alex, Victor, Sam and I, were planning a cruise trip to the Western Caribbean. We wanted fiesta and music, but we also wanted to go beyond and explore new ways to test our spirit of adventure. So, when looking online for the perfect route, we discovered a port that promised fun and adventure, that was exactly what we needed: A trip to Costa Maya. With so many things to do in Mahahual, the little village in the jungle where Costa Maya is located, I am glad we chose to spend the day at Maya, Lost Mayan Kingdom, an adventure park with amazing reviews in Trip Advisor about the most extreme waterslides and zip lines in the Mexican Caribbean. Once there, my 3 friends and I were ready to have every air and water adventure at Mayá Park. We got to Costa Maya early in the morning, so we went directly to have a light breakfast because we knew Mayá was waiting for us, and if we wanted to enjoy it, we had to be completely energized. The most extreme waterslides in Mayá, Lost Mayan Kingdom. Tell me about a big storm!!! This waterslide has 59 ft of height and only takes 4 seconds to go down. It was perfect for racing against my friends, as it has 4 lines. We went down at high speed using a mat. In our first race, Victor was the winner but after that, I won every single time! On the same level as the Pyramid we found the waterslide Underworld. For me, this was the most extreme waterslide. The freefall at the beginning of the ride leaves your heart up in the air. The sensation I felt when I jumped was a mix of adrenaline and fear, but it was so worth it. With a height of 59 ft. and a 90° of inclination, it took me only three seconds to go down. Believe me, this is the highest and fastest waterslide of Mayá Park. It goes down from the top of the pyramid. That means a fall from 78 ft. of pure adrenaline. I must admit it, I was scared when I saw the distance between the waterslide and the floor, but when I was told that in only three seconds I would be splashing the water at the end of the tunnel, I said: “Why not?” So, I jumped, leaving my fears behind. 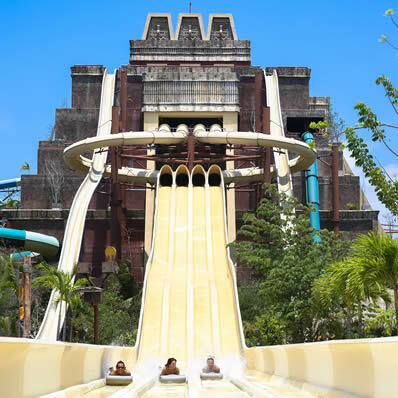 All of the other activities at the Lost Mayan Kingdom were so cool, 2 zip lines, an awesome Zip-Coaster, 2 pools, but believe me, if you are looking for adrenaline and extreme activities, you must come to Maya and go down these waterslides I told you about. You won´t regret it! What are you waiting for? Book your tickets now!